294 pages | 64 B/W Illus. At the turn of the millennium, the unanimous adoption of the Millennium Development Goals (MDGs) by the United Nations General Assembly marked a new chapter in international development. However, voices from the Global South were noticeably absent in shaping the agenda. Fifteen years later, the global context has changed so much that it would have been inconceivable not to have taken voices from the South into account when planning the new Sustainable Development Goals (SDGs). Since its inception in 2012, the Southern Voice on Post-MDG International Development Goals (Southern Voice), a network of 48 think tanks from Africa, Asia and Latin America, has generated a substantial body of original research to feed into various aspects of the post-2015 development agenda, such as the missing dimensions of the MDGs, ways to mitigate existing challenges in delivering on aspiredoutcomes, and new issues, goals, targets and indicators that are crucial for the next global development framework. 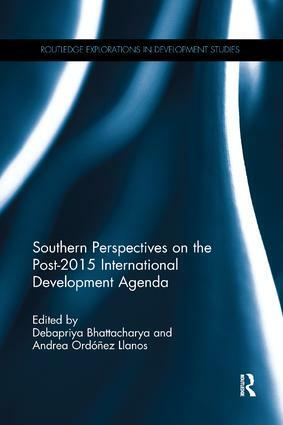 Southern Perspectives on the Post-2015 International Development Agenda consolidates this research and stitches together development realities and policy experiences from the Global South, infusing unique local perspectives to the global debate on the post-2015 agenda. The compendium addresses the overarching themes underpinning the new international development framework by focusing on issues such as sustainability and growth, inclusion and social policies, governance and capacities, and financing of the new agenda. Southern Voice seeks to challenge the "knowledge asymmetry" afflicting the global knowledge system by channelling evidence-based policy analyses produced by centres of excellence, located in the Global South. This is a valuable resource for academics and researchers, policymakers and practitioners, and concerned students in search of alternative views on sustainable development. "The papers in this volume are refreshing: technically sound and effectively critical of policies (in the country and regional context). They are by no means cut from one ideological cloth. In the piles of new publications about the SDGs this book really stands out." – Nancy Birdsall, Founding President, Center for Global Development, USA? Debapriya Bhattacharya is the Chair of Southern Voice on Post-MDG International Development Goals and a Distinguished Fellow at the Centre for Policy Dialogue (CPD), Dhaka, Bangladesh. Andrea Ordóñez Llanos is the Research Coordinator for Southern Voice on Post-MDG International Development Goals. The series features innovative and original research at the regional and global scale. Its scope extends to scholarly works that take an interdisciplinary and comparative approach. The series welcomes submissions from established authors in the field as well as from junior authors. To submit proposals, please contact the Development Studies Editor, Helena Hurd (Helena.Hurd@tandf.co.uk).